In the first exclusive interview series of 2017, we have the greatest honour to hear point of view from Brigadier General Bernd Thran, Deputy Head of EULEX Kosovo about the European Union Rule of Law Mission in Kosovo EULEX. Q: Herr General would you please give us an overview to EULEX mission and its operational pillars. First of all allow me to thank you for giving me, and the Mission, the opportunity to explain what EULEX has already achieved and will continue to deliver throughout its current mandate. But back to your question: in June 2016 the Member States of the European Union and the Kosovo Government agreed on a new mandate for EULEX, leading to the creation of a new Operational Plan to direct the Mission’s activities until June 2018 when the current mandate expires. The EULEX mandate consists of two operational objectives: monitoring, mentoring and advising, and executive. These are delivered through the Strengthening and Executive Divisions. In order to strengthen the chain of criminal justice, EULEX continues to provide Monitoring, Mentoring and Advising (MMA) activities at the strategic level to Kosovo’s rule of law institutions. The Mission delivers assistance to the senior management of the Kosovo Judicial Council, Kosovo Prosecutorial Council, Ministry of Justice, Kosovo Police, Civil Registry and Kosovo Correctional Services. In addition, EULEX provides support to the EU-facilitated dialogue between Belgrade and Pristina by assisting the implementation of remaining dialogue agreements within the sphere of the rule of law. EULEX will continue to implement the rule of law through our executive objective to ensure that the services are delivered until the progress of local authorities allows complete transition of executive functions. Our judges and prosecutors are embedded in Kosovo institutions and serve in accordance with Kosovo law. The focus is on the support to constitutional and civil justice as well as prosecution and adjudication of selected criminal cases both exclusively and jointly with the Kosovo prosecution authorities. The new mandate reflects the fact that Kosovo institutions are demonstrating growing confidence and capacity in the rule of law area. As a result, the Kosovo authorities are increasingly able to assume a whole range of rule of law tasks on their own. Our job until the end of the current mandate is to gradually transfer the remaining executive responsibilities over the rule of law area to Kosovo, taking into consideration the capability and potential of our local counterparts. Q: How do you assess the long years efforts of EULEX mission that have been implemented and the progress that has been achieved so far? Over the last years, the Mission has made significant progress in its main objective, the establishment of an independent, accountable multi-ethnic rule of judiciary in Kosovo, free of political interference. Just to mention a few examples, we have successfully processed and adjudicated corruption, war crimes and organized crimes cases, and we have helped strengthen Kosovo’s rule of law institutions. Since the beginning of the mission, EULEX judges have delivered over 625 verdicts, including 465 verdicts in criminal cases of corruption, organised crime, money laundering, war crimes and human trafficking. These verdicts have included former judges, police officers, members of Parliament and high-level officials. EULEX Special Prosecution Office of Kosovo has been involved in various stages in proceedings in 1350 cases that included UNMIK’s backlog of 854 cases. In addition, we have assisted with the technical implementation of the agreements in the framework of the EU-facilitated dialogue, by facilitating Kosovo Serbian police and civil protection integration into the Kosovo structures. As a result, Kosovo’s institutions have made progress and from now on, we will be in the passenger seat, assisting them while they take the lead. This in itself is a great achievement. This progress has been acknowledged in various reports, including the European Commission Progress Report or the Compact Progress Report. On the other hand, these reports also showed areas where further progress is needed. Therefore, while we have yet to fully accomplish what we set out to do, the road has been paved and signposts are clear. But we must still remain vigilant that this road continues to be followed and no departures from it are taken. The current reconfiguration and ‘shrinking of Mission’s mandate’ embodies this positive change and reflects Kosovo´s readiness to assume greater responsibility. All these changes also reflect the progress made in establishing the rule of law, which is recognised by EU Member States. And what other strategic objectives you envisage to be achieved in the years to come? Our aim is to assist Kosovo in implementing a transparent, sustainable and accountable multi-ethnic justice system, where police and customs operate with clearly defined roles within a sound legal framework, where rule of law institutions conform to accepted European standards, free from political influence. Our strategy after the end of the current mandate in 2018 will depend on this progress and whether we reach a point where it is possible for all of our mandate to be handed over to the locals or other international actors. Q: Police and Law-Enforcement are the central components of the EULEX mission. Could you please describe the role that they play for maintaining stability and security in Kosovo. EULEX Police continues to provide support to Kosovo Police (KP) through its strengthening and executive mandate. Our aim is for KP to reach the highest international standards in provision of its law enforcement services for the benefit of all Kosovo citizens. I believe that Kosovo Police has made a substantial progress. This is documented in the latest polls showing that KP is the most trusted institution in Kosovo. A recent Transparency International report says that Kosovo Police is among the most independent and credible forces in the Western Balkans. The Mission works together with KP providing monitoring, mentoring and advice to its force on a strategic leadership level. In addition, we provide operational support and work jointly with KP accomplishing various policing tasks. Moreover, through its Strengthening Division, EULEX provides strategic support to KP senior management, by monitoring, mentoring and advising on the police’s ability to address structural and organizational weaknesses in order to improve targeting of serious criminality. The emphasis is given to strengthening KP capacities in the fight against organised crime, corruption and enhanced cooperation between prosecutors and the police. EULEX Executive Police is working jointly with Kosovo Police in performing arrests and high-risk operations. The Executive Police provide support for rule of law operations such as searches, arrests, patrolling and intervention, assisting in building KP capabilities to be able to support the investigation and prosecution of sensitive criminal cases. Kosovo Police is a reliable and effective police force that is capable of performing various tasks in a civilian environment such as crowd and riot control, special weapons and tactics and investigations of organised crime groups. Such a police force is an essential element of stability in Kosovo. We work together with KP to constantly improve and advance its operational capability in order to advance its service for Kosovo’s citizens through mentoring, training, identifying equipment and skill needs, as well as by jointly performing police operations. Q: Since its inception, EULEX has developed and maintains a close partnership with KFOR. What is the main core that this partnership is based upon ? And what other long term complementary developments do you wish to see in this partnership? The partnership is based on the closest possible cooperation and coordination between EULEX and KFOR on the ground. The areas of cooperation and coordination, in line with the joint operating procedures, encompass civil disturbance situations, information and intelligence sharing, military support to police operations, border issues, protection and evacuation support. EULEX and KFOR closely cooperate in contributing to a safe and secure environment in Kosovo with EULEX being the second and KFOR the third security-responder. The first security responder is Kosovo Police. The close cooperation is also reflected by a dedicated officer both in EULEX and KFOR to conduct liaison between the two organisations. Q: Could you please speak on the subject of EULEX and its multiple operational partnerships with the local and regional authorities and the Law-Enforcement Agencies. EULEX Executive Police is maintaining cooperation and communication with local and regional law enforcement agencies through UNMIK Interpol Liaison Office which is working as INTERPOL National Centre Bureau for Kosovo, with EUROPOL, with the Serbian Police and with the Liaison Officers-Police Attaché deployed within the Embassies in Pristina. At the regional level EULEX is exchanging information on an operational basis through the INTERPOL channel. The Technical Arrangement with UNMIK establishes a framework for co-operation in the field of crime prevention and criminal justice, including the exchange of police information, the publication and circulation of INTERPOL notices and access to the INTERPOL telecommunications network and databases. EUROPOL provides support with a range of services but mainly supporting the analysis of information. In an effort to strengthen regional police cooperation, EULEX facilitated a regional conference in Skopje last September which was attended by representatives of the police services of fYRoM, Serbia, Kosovo and Albania. The conference was organised to intensify the cooperation and harmonise further actions related to terrorism and organised crime in the Balkans. At the conference, all regional police directors agreed to intensify the exchange of information and to identify the means of more expedient information sharing. The Directors pledged to continue organising regional conferences on a regular basis in order to further the means of a closer mutual assistance and information sharing and gathering. We as a Mission strongly support such initiatives of the police services in the region in their approach to further develop and enhance their collaboration. This is now a strong reminder for me to look into the preparations for the next regional conference. Q: From November 21- 26 the Exercise Silver Sabre-2 was executed with the joint forces of KFOR, EULEX, KP and KSF. As Deputy Head of EULEX you have attended the event. What were the main aims of EULEX to take part in this exercise? How do you foresee a similar joint training can benefit the long term security of the region. EULEX Executive Police and its Formed Police Unit (FPU) were EULEX’s main actors that took part in this exercise. It was organised by KFOR and the purpose of the exercise was to improve coordination, planning and execution of natural disasters and civil disturbance operations. The participants actd in their established roles as first, second and third security responders: Kosovo Police and the Kosovo Security Force (1st responder), EULEX (2nd responder) and KFOR (3rd responder). The exercise in itself builds upon CRC training and natural disaster operations completed by the units, combined training and exercises between KP, KSF, EULEX and KFOR at the unit level (company/platoon). The command staff of the Mission’s Executive Police took part in the Staff Training part of the exercise, where the staff officers practiced interoperability, liaison and synchronization between all four stakeholders in a Table Top Exercise. Simultaneously one platoon of the FPU trained several scenarios of crowds and riot control tactics, techniques and procedures together with the KP and the Kosovo Security Force (KSF) and KFOR units. This part was called “Forces Training”. Silver Sabre involves multiple KFOR units as well as KP, KSF and EULEX who focus on handling civil disturbance and natural disaster scenarios Kosovo-wide using the 1st, 2nd and 3rd responder concept. The key tasks of the exercise included ensuring the commanders and staff of participating organizations understand their different roles and capabilities responding to situations in Kosovo, as well as them understanding how to effectively liaise and synchronize their actions and to be able to conduct joint planning and decision making. Furthermore, the exercise ensured that all the forces were familiar with crowd and riot control tactics and can demonstrate in practice a joint response to civil disturbances and managing natural disasters. Essentially, the three security responders left the exercise with an improved mutual understanding of their roles, capabilities and capacities in the above situations, as well as better liaison, synchronization and interagency cooperation in the context of the three-security-responder concept. Q: Would you like to elaborate on the contributions of U.S, European and German Police Forces in the EULEX mission. The main contribution to the Mission’s police staff comes, obviously, from European Union Member States. However the U.S Police forces contribute significantly to the Mission’s efforts, mainly with investigators who work alongside their EU colleagues. From the beginning of the Mission, U.S police officers have also been dedicated to the monitoring, mentoring and advising of colleagues in the Kosovo Police. This capacity building of the local police forces by U.S officers has a long tradition: in 1999 the U.S police (at the time working for the OSCE) took the lead in establishing the Kosovo Police Academy. German Laender and the German Federal authorities have always contributed generously to the Mission with police experts from all ranks, meaning that Germany has always been one of the biggest contingents amongst EULEX staff. 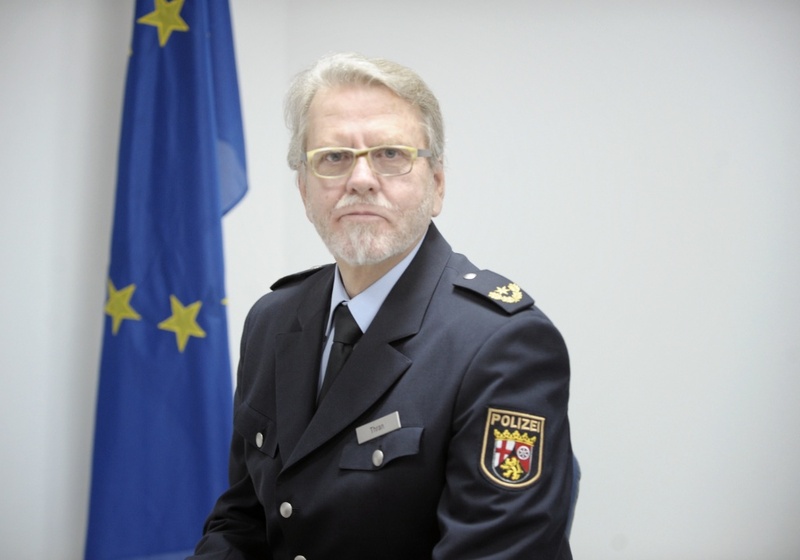 For several years the EULEX executive police forces were led by German Officers, now I, as the Deputy Head of Mission am the most senior German Police officer in EULEX. But besides covering all of the EULEX executive functions, many of my German colleagues are also dedicated to assist our Kosovo colleagues in improving their skills. While in the past the mission advised and monitored Kosovo Police on different ranks, from the station level up to the central levels in the Ministry of Interior, lately we have focused only on strategically important positions in Pristina and in the north of Kosovo. Meanwhile, German police officers have been engaged on both sides of the Ibar River to transfer knowledge to their local counterparts. The Interview is subject to Copyright Law. ©EULEX/Deutschland in der Welt.org. All Rights reserved. Started from January 2016 until the end of December Germany had the OSCE Chairmanship for the year of 2016.
were the pillars on which the German Foreign Office architected its policy for this occasion. The final phase of Germany OSCE Chairmanship was concluded in December with the 23rd OSCE Ministerial Council meeting in Hamburg. On December 9th, on the second day of OSCE Ministerial Council in Hamburg– the special attention was given to the subject of the Human Rights Defenders. The 23rd OSCE Ministerial Council meeting took place with the participants of 57 OSCE member States in Hamburg from December 8-9. The event was executed under Germany’s OSCE Chairmanship and the invitation of OSCE Chairperson-in office, German Foreign Minister Dr.Frank-Walter Steinmeier. The Council’s decision for the Chairmanship of 2018 went for Italy and the 2019 for Slovakia. are the Concepts of Germany’s Foreign Policy which are promised, by German Government, to be extended firm and actively, to its Seat at the UN Security Council for 2019/2020. “…….On Human Rights Day and during Human Rights Week, we reflect on how far we have come in upholding these universal rights and resolve to continue fighting to safeguard them wherever they are threatened.” December 9, 2016 © The White House Press Secretary. On December 1, Minister Dr. Steinmeier and Minister Jean‑Marc Ayrault presented this year’s Franco-German Prize for Human Rights to 16 Human Right Defenders from several countries. Excerpts of the speech by Foreign Minister Dr. Steinmeier during the Award ceremony.